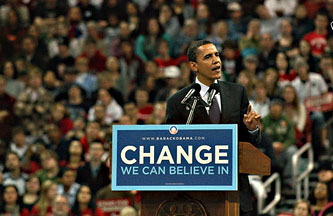 Mr. Obama and the Democrats have wasted the once-in-a-lifetime opportunity handed to them in the 2008 election. They did not focus on jobs, jobs, jobs as their primary mission, and they did not call on Americans to join in a bold national effort (which would have required a great deal of shared sacrifice) to solve a wide range of very serious problems, from our over-reliance on fossil fuels to the sorry state of public education to the need to rebuild the nation’s rotting infrastructure. upon us, it would have been very difficult for Republicans on Capitol Hill to stand in the way of a rebuild-America campaign aimed at putting millions of men and women back to work. This is so far beyond wrong I hardly know what to call it. All of these things could have been pulled together under the umbrella of job creation? No, they couldn’t have. It would have been difficult for Republicans to stand in the way of putting millions of men and women back to work? In what alternate universe? Republicans almost unanimously filibustered Obama’s stimulus package four weeks after he took office. They’ve filibustered the extension of unemployment benefits every time it’s come up. They’ve filibustered jobs bills, public works bills, education bills, and just about every other bill you can name. There’s nothing Obama could have done to change that. They all supported Obama in the primaries and all celebrated his election. They are all left-of-center. And they all feel let down by the administration right now. They are still Obama supporters but, unless something changes, he will soon move in to the territory both Clinton and Carter inhabited. He will have our support because he’s a Democratic President up against utterly unpatriotic and selfish lunatics, bigots, and troglodytes. It will be simply be the “consider the alternative” kind of support. We had hoped for much more. We wanted to feel what our grandparents and great-grandparents felt for FDR — that he was out there battling for working people, the unemployed, and, frankly, an America strikingly different than the one they were living in….I want FDR style politics and TR style rhetoric (“the bully pulpit”). Right now, I don’t see it. Neither does columnist Herbert. And, yes, I recognize the constraints. But Presidents have to transcend them, or at least be seen as fighting like hell. I don’t see that happening. Italics mine. Like Rosenberg, I’ve been feeling pretty schizophrenic about Obama for quite a while. My brain tells me that, given the realities and constraints of American politics, he’s done pretty well: a big stimulus package, the Lilly Ledbetter Act, healthcare reform, withdrawal from Iraq seemingly on schedule, a decent start on rationalizing Pentagon procurement, financial reform (maybe), and progress on DADT (hopefully). Even his Afghanistan policy, which I don’t agree with, was deeply considered and responsive to the obvious limitations of military action. There are, of course, things I don’t like about Obama’s record too. I wish he hadn’t reappointed Ben Bernanke. I wish he’d nominated Diane Wood to the Supreme Court instead of Elena Kagan. His record on civil liberties issues, with a few noticeable exceptions, has been generally lousy. I wish he’d listened to Joe Biden on Afghanistan. I’m not sure that bailing out Chrysler was worth the taxpayer’s money. But this isn’t why I’m schizophrenic about Obama. I never expected to like everything he did. The reason I’m schizophrenic is that it’s almost impossible to get a handle on what he really wants. Did he want a bigger stimulus bill but compromised down because $800 billion was all he could get? Or did he not really want more than that in the first place? Ditto for the public option. Ditto for DADT repeal, which he had to be pushed into supporting this year. And ditto again on financial reform, which is worth passing only because of numerous amendments to the original bill. On all of these issues and more, I don’t feel like I ever knew what Obama’s real position was. There’s a big difference between compromising because politics is what it is and you have no choice, and compromising because the more centrist position is the one you genuinely hold. But Obama never gives me a good sense of which it is with him. Now, it’s a bad idea to look at FDR through rose colored glasses. Plenty of New Deal legislation passed over his objection, and there was nobody better at playing his cards close to his vest. Still, there was seldom any question about where FDR stood on the big issues, and you either loved him or hated him for it. With Obama, I’m left unsure far too often for comfort. Thus my schizophrenia.